Pacific Coastal Airlines is pleased to announce the addition of a Saab 340B and a Beechcraft 1900D to its current fleet of aircraft. "The new 340B can carry up to thirty four passengers, four more than our existing Saab 340A's, and provides an additional eight hundred pounds of lift", says Pacific Coastal Airlines' Vice President of Operations Rob Kidner, "while the Beechcraft 1900D offers more head space and has a roomier cabin than our current Beechcraft 1900C's". The new aircraft are needed to support recent growth in the airline's charter and regularly scheduled services. In January Pacific Coastal began six day a week non-stop regularly scheduled service from Vancouver to Prince George, and in May began a regular week-day charter service to Dease Lake with flights originating in Vancouver and making stops enroute at Kelowna, Kamloops, Williams Lake, Prince George and Smithers as required. "We're looking to add another Saab 340B to our fleet and hope to have it in service within the next few months", says Kidner. The addition of the Saab 340B provided Pacific Coastal with a chance to add a new branded livery, which includes a bold orange swoop to contrast with the airline's traditional blue and white colour scheme. "It's a fresh new look and feel and we think it really stands out in the air and on the tarmac", adds Kidner. These additional aircraft bring Pacific Coastal Airlines' fleet to a total of twenty two aircraft, including its seaplane division based in Port Hardy on Northern Vancouver Island. The B.C. owned and operated company flies to more than sixty five regularly scheduled destinations in British Columbia and provides cargo and charter services across western Canada and the U.S. Started nearly forty years ago in Bella Coola, Pacific Coastal Airlines is now the sixth largest airline operating at Vancouver International Airport based on outbound seats, and third largest airline in takeoffs and landings. 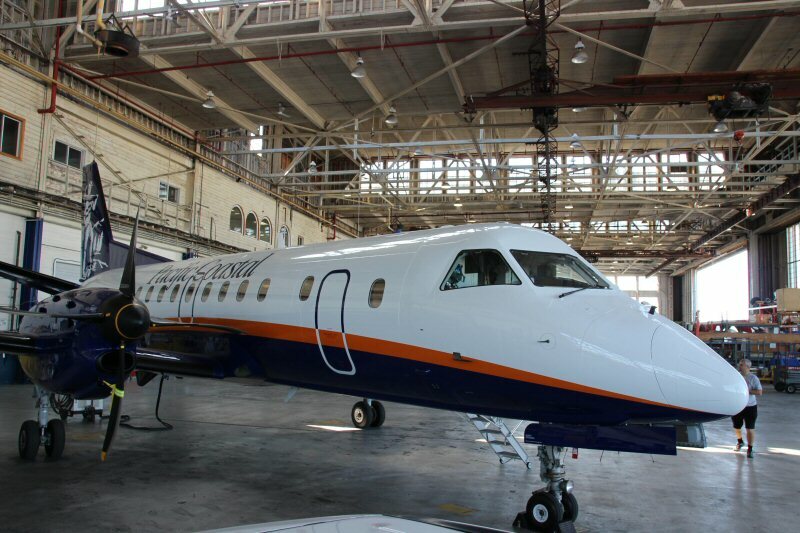 Saab 340B gets a final spit and polish inspection at Pacific Coastal Airlines' hangar in Richmond, B.C., one of two new aircraft recently added to the local airline's fleet.